Shampoo soft, of frequent use, indicated for all type of hair. 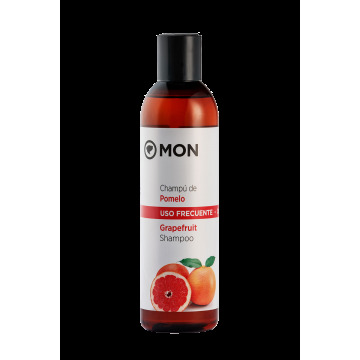 It balances the pH, provides shine and volume due to its formulation, with Grapefruit essential oil. Made with Grapefruit essential oil. Apply to damp hair and let it act for 2 or 3 minutes. Rinse. Aqua, Sodium Lauryl Sulfate, Cocamidopropyl Betaine, Laureth Disodium Sulfosuccinate, Cocamide DEA, Citrus Paradisi Extracted Shell Oil, Menthol, Hydroxypropyl Guar Hydroxypropyltrimonium Chloride, Lactic Acid, Sodium Chloride, Phenoxyethanol, Triethylene Glycol, Limonene.